OnePlus relased yet another OTA update for the OnePlus 5 and the 5T phones. This is another HotFix update for the Oxygen OS 9.0 based on Android 9.0 Pie. Oxygen OS 9.0.3 HotFix fixed the new WiFi connectivity issue with certain third-party apps, brought improvements to the stability for sound settings. The update also brought stability for system upgraded via OTA. 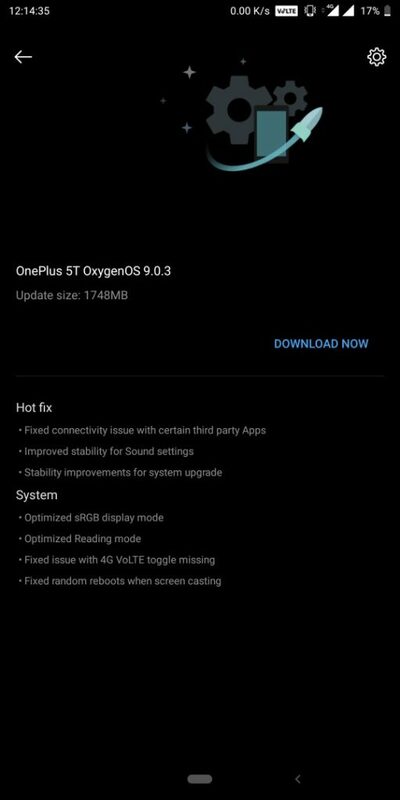 So download and install the Oxygen OS 9.0.3 for OnePlus 5/5T HotFix OTA. We already have the official Android 9.0 Pie firmware update for OnePlus 5 with with the first Oxygen OS 9.0 stable OTA update. Previous Oxygen OS 9.0.1 brought some amazing features and critical bug fixes featuring stability for WiFi connection, fixed a very important issue where 4G VoLTE toggle would be missing from settings. Then we received Oxygen OS 9.0.2 that fixed eRGB display mode, optimized Reading mode, fixed random reboots while screen casting, and an updated camera app. Here we have the latest Oxygen OS 9.0.3 full stock firmware zip available for OnePlus 5 and 5T. The OTA update zip is now available for OnePlus 5T and that for the OnePlus 5 is here too. You can simply grab the zip and perform a local upgrade or flash it directly using TWRP if your Android is rooted. First, check if it has a compatibility zip. If it does remove it, create the zip and then flash it using TWRP recovery. If you need TWRP recovery, get it from the Oxygen OS 5.1.7 post. Read: How to Update OnePlus 5/5T to Android 9.0 Pie based on Oxygen OS 9.0.1?